The Liberal politician Joseph Chamberlain said in 1886, and the Labour Prime Minister Harold Wilson said much the same in 1964, that ‘in politics, there is no use in looking beyond the next fortnight’. We will soon know the reforms that David Cameron has been offered by the European Union as a result of his around the clock diplomacy. If he accepts what is offered, selling it to a bitterly divided Cabinet and to his party, let alone to voters, will be a nightmare. It is like a box of fireworks, which when lit will go off in unpredictable directions. But the government stands to lose either way. Following its unexpected general election victory in May 2015, and no longer restrained by its coalition with the Liberal Democrats, the Conservative government is moving Britain towards a one-party state, in which the free market must be allowed to reign unchallenged. But leaving the EU risks a collapse in confidence in Britain’s financial markets. Many right-wing MPs believe that regaining parliamentary sovereignty is paramount and want to leave the EU regardless of whatever concessions are made by the EU. They are even more in thrall to a laissez-faire economy, and they also believe that by leaving the EU, Britain’s economy will flourish. The future of the Conservative government is on the line, not just on the referendum, but on many other critical issues right up to the next general election in 2020. My own predictions out what is going to happen in that time are at the end this post. But first, how are we drifting towards a one-party state? The Conservatives won the general election in 2015 with 37% of the vote. Labour got 30% of the vote, the Liberal Democrats 8%, UKIP (the UK Independence Party) 12%, and the Greens 4%. 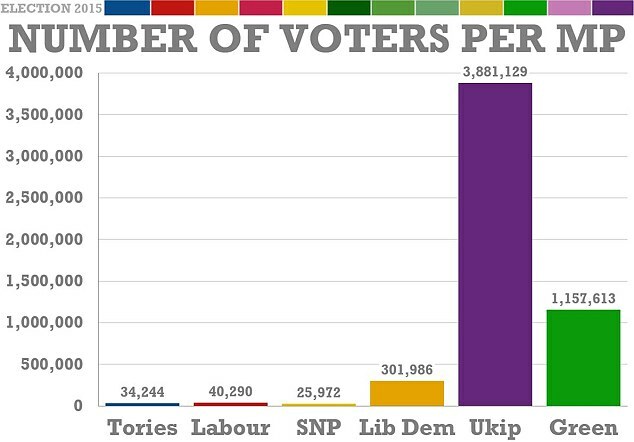 Yet under the first-past-the post-system (FPTP), the number of MPs voted in had little to do with the number of votes cast for a particular party as the picture to the left shows. There was of course a referendum in 2011 on changing the electoral system, but the only voting system that the coalition government, led by the Conservatives, would agree to be put to the people was based on the Alternative Vote (AV). This had previously been described by Nick Clegg, the leader of the Liberal Democrats, as a ‘miserable little compromise’, and it was loved by no one. The Electoral Commission’s explanation of the AV system was hideously complex, whilst that for FPTP took only three sentences. In the end, the No campaign, supported by the Conservatives opposed, was dirty and deceitful, whilst the Yes campaign, half-heartedly supported by the Labour Party, was lack-lustre and muddled. The outcome was almost 70% voting against a change and 30% in support. Despite there being electoral systems elsewhere that link a party’s tally of votes to its tally of seats, mention anything to do with the constitution to many people and their eyes will glaze over. Unsurprisingly the turnout in the 2011 referendum was only 42%. But the reality is that under FPTP a small number of swing voters can decide who is in government. There is a good explanation here, published by the Electoral Reform Society, of why FPTP is such an undemocratic method of electing our MPs, and why it doesn’t deliver what it claims. The government has made or is making major changes to political processes so as to ensure that the chance of opposition parties forming a government, whether one party or as part of a coalition, is dramatically reduced. the Chancellor in his 2015 autumn statement announced plans for a 19% cut in state funding for opposition parties, the so-called ‘Short money’ named after the former minister Edward Short, who devised the system in 1974. This was to compensate opposition parties for not having access to Whitehall resources and it has been in place for 40 years. The move will hit the finances of Labour, the SNP, the Liberal Democrats, Greens and other smaller parties, with the Labour Party set to lose £1m. The government though has relatively free rein to appoint its own special advisers paid for by the state, and since 2010 the cost of this has increased from £5.0m in 2009 to £8.4 in 2014.
the government has changed the method of voter registration so that individuals have to register by 1 December 2015 in order to remain on the electoral list. Previously registration was done on a household by household basis. The government cited the need to stop fraudulent voting and to remove ghost entries, though fraud is almost non-existent. The Electoral Commission warned at the time that this could disenfranchise almost two million voters. The majority of these voters are young people and students, or people from ethnic minorities, people who are more likely to vote for opposition parties. 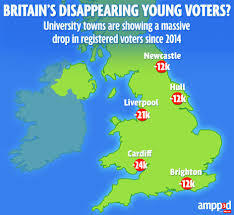 These lost voters, together with the estimated 8 million people who are missing from the register, equates to 19% of all eligible adults not being on the electoral register. No major national campaigns are planned to persuade people to register. in the Trade Union Bill now going through Parliament, the government is attempting to change the basis on which trade unions are able to make donations to the Labour Party. The outcome will be that the party will lose millions of pounds. The Conservative Party’s main sources of funding, corporate and private donations, which include 50 or so multi-millionaires, will remain untouched. the government’s increasing use of statutory instruments as a back door means to change legislation, as opposed to Bills being presented to Parliament, has soared under the present government. George Osborne used a statutory instrument to introduce proposed cuts to tax credits. When the House of Lords opposed this, criticising the government for legislating through the back-door, Osborne attacked the House of Lords as an unelected body. The House of Lords should of course be an elected second chamber, but contrary to its feigned outrage, the government has thrown every obstacle in the path of reform of the second chamber. Osborne with no sense of irony threatened to flood the House of Lords with new Tory peers so that their defiance could not be repeated. Incidentally the government’s intention to reduce the number of parliamentary constituencies from 650 to 600, and for number of electors within each constituency to be within 5% of the average number, which was agreed by Parliament in 2011, will now be progressed by the Electoral Commission. Whilst it is estimated that Labour will lose 20 seats as a result, the principle of having constituencies of more equal size cannot be said as such to be undemocratic as has been argued by some. What is undemocratic is that FPTP will continue to be used to decide the winner in each of the ‘more equal’ constituencies. The winner can take all just by a few voters changing how they vote. The theoretical absurdity of FPTP is that one party could win every one of the 600 seats in Parliament with just a majority of one in each. No opposition MPs at all in Parliament? Just 600 votes could do it.